Dorset Blue Vinny is particularly interesting as an example of the skimmed-milk cheeses which used to be made with the milk left over from butter-making virtually all over Britain. Many of them, apparently including Blue Vinny, were so hard that jokes were made about them, such as that they were used for the soles of shoes. Michael Davies’s version, however, is crumbly rather than hard and does not strike one as particularly low-fat: this is partly because the milk is skimmed by hand, as is traditional, which means that it retains a small but significant proportion of fat (Michael reckons about 3%). 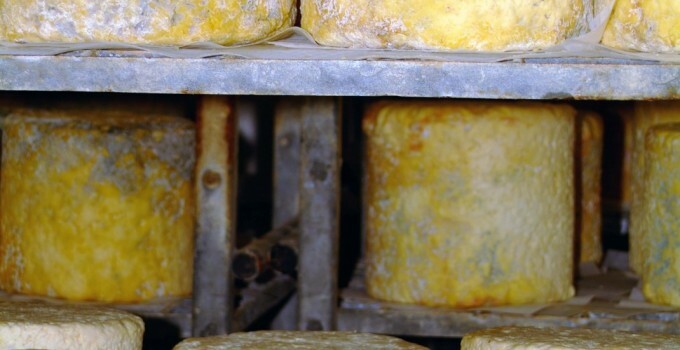 Despite the fact that the cheese is sometimes very blue, it is not overwhelmingly strong, since the mould has a relatively mild herbal taste. It is not only very good on the cheeseboard, with pears or fresh figs, but toasted or as a flavouring in cooking. The cheese is made of raw milk from the producer’s own herd of Friesians. Since the Second World War, the cheese was only made in very small quantities on one or two farms until it was revived by Michael Davies (member of the ‘Specialist Cheesemakers’ Association), who is now the sole producer. His output is 500-600 kg per week. The cheese is fairly widely distributed throughout England. Graysons Restaurants are key sponsors of the Ark of Taste within the UK.